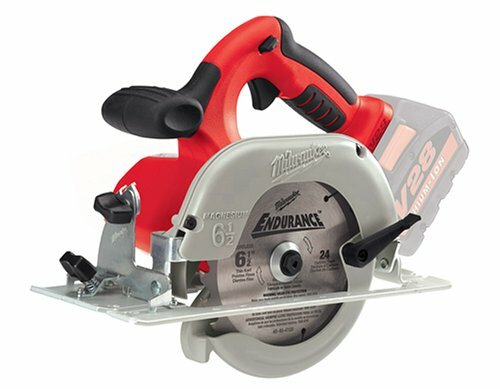 The V28 cordless woodcutting circular saw from Milwaukee is powerful and practical. You'll be deeply impressed by the speed of cutting and overall run time, and this saw comes standard with tactile grips for even more control while cutting. It features lightweight magnesium guards that reduce unnecessary weight without compromising operation, and a high-strength aircraft aluminum shoe that resists bending for accuracy and dependability. Why waste time with extension cords and generators? The V28 cordless circular saw is ready to go right now, with no more downtime from cut cords, and no cords to trip over while working in precarious locations. The V28 provides the power of a corded tool with none of the added problems. By far the best battery operated saw I've ever used and owned. Lots of power, cuts through 2x's like butter even with the 40 tooth blade. Buying this "tool only" saw is nice if you already have the charger and batteries. You save alot of money from buying a kit with batteries and charger if you don't need them. Easy to use and lots of power. I reach for the V28 all the time. Sometimes for a big job, I need a corded circular saw, but most of the time, this one does the job with ease. tired of dragging the cord around? 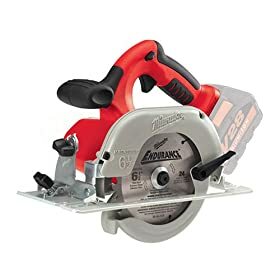 i would recomend this tool for everything except full 2" rough cut lumber. has good power on dry finished lumber but struggles with a full 2" deep cut.it's light weight and pretty tough. i dropped a wet 2"x12"x6' board on it last night and expected that to be the end, but not a scatch. the blade adjustment is on the right side of the tool making the adjustment a bit different if you're used to a worm drive skill. but for a quick job or cut it beats dragging out a cord. battery life is pretty good to. of course you always want 2.